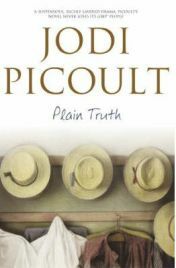 I have read quite a few of Jodi Picoult’s novels before, but having just finished ‘Plain Truth‘ I feel that this was the most moving and compelling by far. In ‘Plain Truth‘ we are taken right into the heart of the Amish (Plain) Community in America, where an eighteen year old girl, Katie Fisher, is accused of murdering her new born baby. Katie claims not to remember what happened on July 10th, when in the middle of the night in the family barn she gave birth silently and secretly, only later, after falling asleep, to discover that her newborn has died. Once the baby’s body is discovered, there is a police investigation and Katie stands accused of first degree murder. There is a great deal of evidence to incriminate her, not least is the fact that she concealed her pregnancy from everyone. Meanwhile, the reader has also met Ellie Hathaway. She is a hot shot but somewhat disillusioned defence lawyer, who is taking some time out with a distant relation who also happens to be Katie’s aunt. She is the only one in a position to defend Katie, but in order to make bail, she has to agree to live with Katie on her parent’s farm and practically adopt the Amish way of life. This is very difficult for a seasoned city girl, but over the course of the novel she comes to appreciate the simple way of life adopted by the Amish. The novel is split into two parts. The first part is the time leading up to the trial. At first Katie and Ellie are unwilling roommates, but as time proceeds, they learn to both like and trust each other. Through this Katie starts to open up to Ellie and piece together what happened that terrible night, and through what she learns, Ellie starts to build her defence. There is also a love interest for Ellie, when she is reunited through the case with Coop, a psychiatrist and former boyfriend. In the second part there is the totally compelling court case driving towards the verdict – it’s very hard to predict what that will be (and of course I’m not going to tell you here!) As the prosecution and defence both make their cases though, you find yourself really caught up with the drama and almost living the trial along with Katie and Ellie. It does make for very tense reading at times! I’m not going to say any more about the actual plot, but would definitely urge any Picoult fans to read this one. I do want to comment on some of the elements which made me like the book though and bits I found interesting. I found the fact that the story was set within the Amish (Plain) community absolutely fascinating and I really learned a lot about that way of life. You learn about the sense of community and what it means to be Amish. You also discover what it is like for an Amish person who does not conform, such as Katie’s brother, Jacob. In the Amish way of life, no one continues any studying beyond the eighth grade. However, Jacob had a love of books and learning which inevitably led him to choose further study at university over his Amish life. For this reason, he is ‘shunned’ and in his father’s eyes, he is dead! Jacob’s story does also form an integral part of the story. You also learn a lot about the faith, and how if anyone commits a wrong they must confess, then be shunned for a period of time, but ultimately forgiven! This also is so integral to the plot, as these beliefs cause Katie numerous problems, when facing the ‘English’ system of justice. Another reason I really liked this novel was the brilliant characterisation and the different relationships which are formed. The main two, Katie and Ellie, are very well developed, and as the reader, you really start caring about what happens. Also, as it is a rather shaky relationship at the start, with lots of misunderstandings, you also feel at times frustrated. It often seems like ‘two steps forward and one step back! There are also various other characters, particularly the Amish ones, who are very interesting. One character, who has to go through a lot of soul searching, is Samuel, Katie’s boyfriends. You are not supposed to have too much pride if you are Amish, but sometimes it’s hard to follow what is right! I also love the character of Coop, who is Ellie’s love interest. He is another character who is totally baffled by a woman, but I guess there’s nothing new there! What I love most about this book though, is just that it is such a good story. Essentially it is a tragedy, and it is not easy to read about the death of a newborn, whatever the circumstances. It is also a love story as well though, with both physical and spiritual love coming through very strong! There are different love stories within it to, both of lovers and of family. It is also a murder mystery followed by a tense courtroom drama, so this book basically has something of everything, and it is all done so well, because, in my view, Jodi Picoult is an exceptionally good writer. The title ‘Plain Truth‘ is also very clever. It can be taken at face value just as in telling the plain truth. Also though, as the Amish people are also called ‘Plain’ it really means that this is about what these people see as the truth! So, do I recommend this book? Of course I do – it’s a totally brilliant read, and a book I just didn’t want to end I was so engrossed in it. There are also some books which at times are hard to pick up, but with ‘Plain Truth‘, it was the reverse – I just didn’t want to put it down! It’s the sort of book which you wonder what you can follow it with that won’t be a disappointment! No Comments on "Plain Truth"